John Lasseter, co-founder of Pixar and chief creative officer for Pixar and Walt Disney Animation, is the latest high-profile Hollywood power player to take a leave of absence amid charges of sexual harassment—or, as he puts it, “unwanted hugs.” Lasseter uses that very Disney-esque phrase in a memo to his employees reprinted in The Hollywood Reporter, in which he acknowledges his “missteps” and recent “difficult conversations” he’s had with staff. 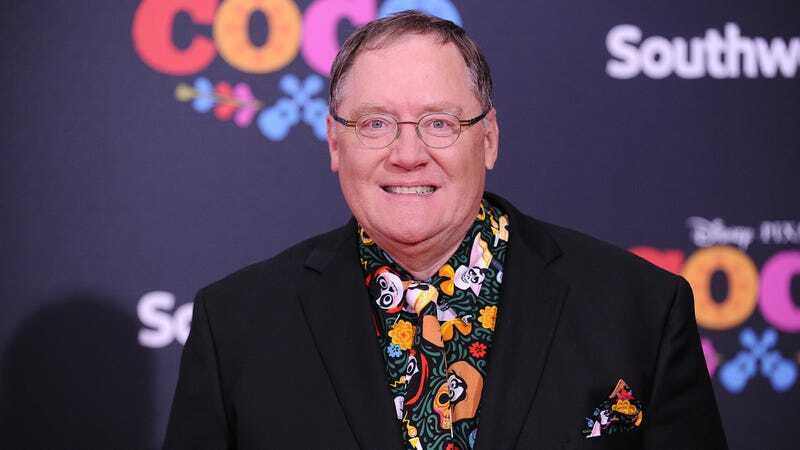 “It’s been brought to my attention that I have made some of you feel disrespected or uncomfortable,” he writes, adding, “I especially want to apologize to anyone who has ever been on the receiving end of an unwanted hug or any other gesture they felt crossed the line in any way, shape, or form.” Lasseter goes on to say that he will be taking a six-month leave of absence from Pixar “to start taking better care of myself, to recharge and be inspired,” after which point it sounds like he will return to the company in his previous position. A new story in The Hollywood Reporter released just after the news of Lasseter’s leave of absence broke paints a less rosy picture, with an anonymous Pixar employee telling the publication that Lasseter was known not only for those unwanted hugs, but also for “grabbing, kissing, [and] making comments about physical attributes” at social events and in the office. Other anonymous sources say that women at Pixar had perfected their techniques to deflect Lasseter’s propensity for kisses and wandering hands, including a defensive posture, known internally as “the Lasseter,” designed to keep him from putting his hands on their thighs in meetings. The same sources allege that although she’s still credited as a writer on the film, Rashida Jones and her writing partner Will McCormack left Toy Story 4 early on after an “unwanted advance” from Lasseter. Lasseter, who made his feature directorial debut with 1996’s Toy Story, is named as a producer or executive producer on every Pixar film, and as an executive producer on all Walt Disney Animation films. He’s been credited with overseeing Disney Animation’s return to prominence with recent efforts like Frozen and Moana. The full memo sent out earlier today to Disney Animation staff is below.